Amazon RDS is a secure and reliable web-based service, which greatly simplifies the process of deploying, managing, and scaling relational databases in the cloud, thus, allowing you to connect at any time and from any place where the Internet access is available. With Amazon RDS, it is much more convenient, fast and efficient to create backups and recoveries, store and monitor database instances with several clicks. 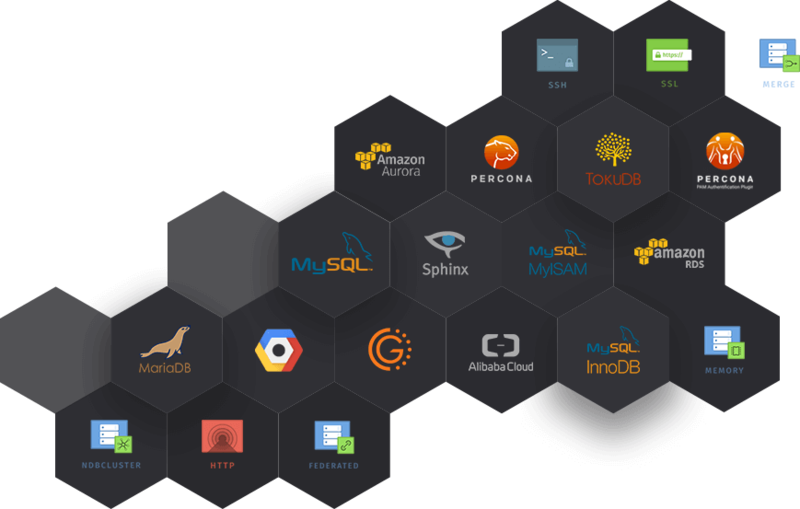 Currently, it supports such database engines as Amazon Aurora, MySQL, MariaDB, PostgreSQL, Oracle, and Microsoft SQL Server. 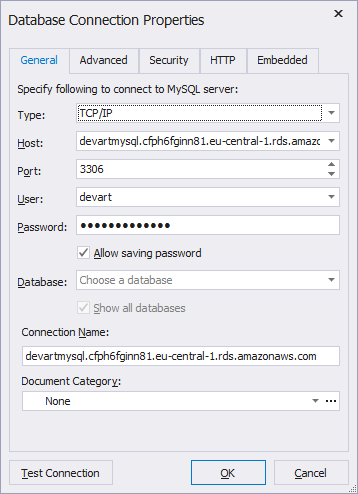 In this post, we are going to show how to easily connect to Amazon RDS MySQL instance using dbForge Studio for MySQL. 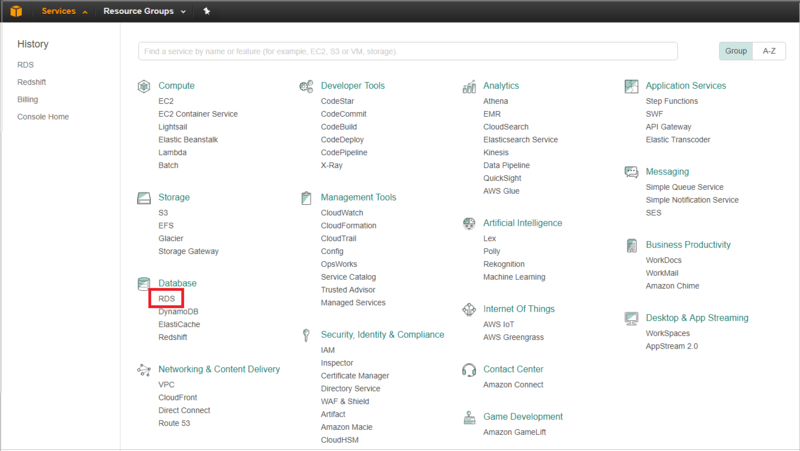 Once logged in to Amazon RDS, go to the Services management console and select RDS in the Database section. To create a database instance, click Launch DB Instance on the Instances tab. 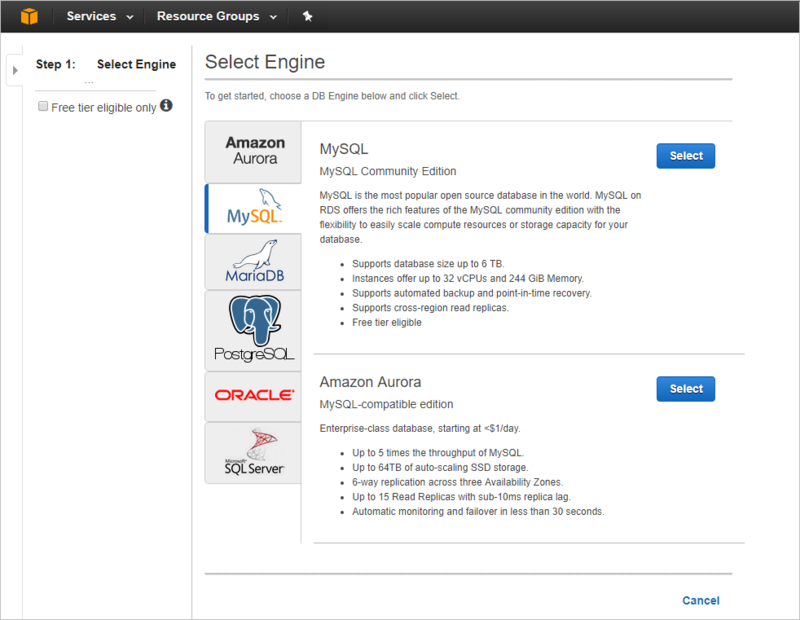 To choose the required database engine, click Select next to MySQL. Here you can also find some general information about scalability resources and storage capacity for the database. Depending on your production purposes, select either Production or Dev/Test options. Next, specify the instance specifications that meet your requirements. Here you need to create a DB instance identifier, your master username, and password, which you will use when connecting to Amazon RDS in dbForge Studio for MySQL, as well as configure other settings. Once it is done, click Next Step. Note: Copy your master username and password in advance so that you can use them when connecting to Amazon RDS. Moreover, you can check the cost of your monthly subscription for the instance on the left of the Specify DB Details section. You can set additional settings that include database options, network and security, backup, monitoring, and maintenance parameters. After all the settings are identified, click Launch DB Instance. After the instance process is launched (it may require some time to be completed), you can see the status, as well as other configuration information in the corresponding window. If you would like to view more details on your database instance, click the Expand button. The dashboard will provide some information about recent events, including memory and CPU utilization, read and write IOPS. To view the host name with the port, have a look at the endpoint. When the status of the instance is available, which means that the database instance has been deployed, you can go to dbForge Studio for MySQL to connect to Amazon RDS. In the Database Connection Properties window, specify Type, enter the Host name without its port into the Host and Connection Name fields. The port, as well as master username and password, are added to the Port, User and Password fields. 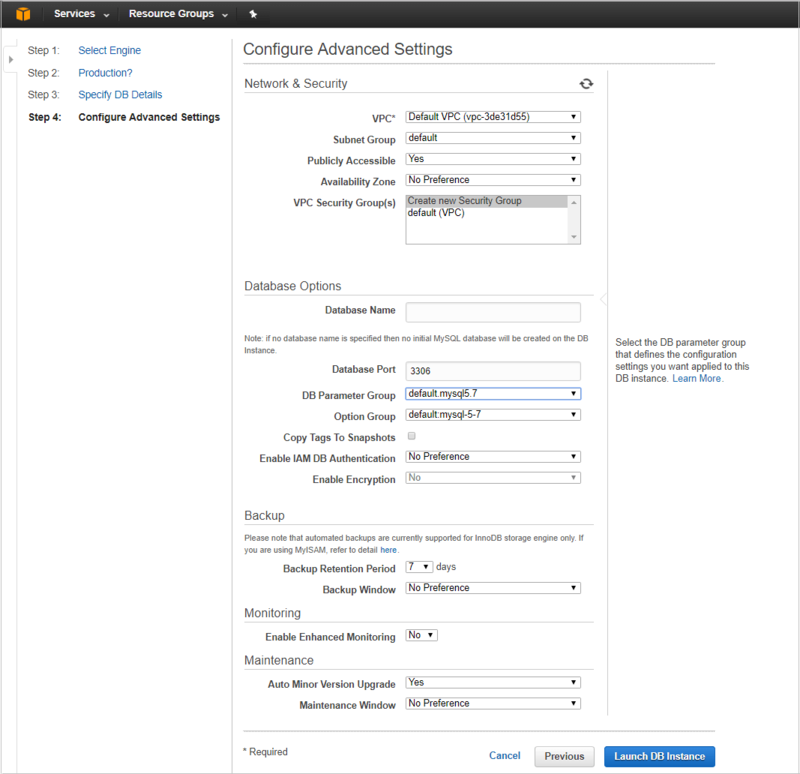 Once all the settings are configured, click OK.
As you can see, the process of connecting to Amazon RDS is actually easy and simple. It does not require much time and can be completed in a few clicks. After you deploy the database instance, you are welcome to manage and modify databases. dbForge Studio for MySQL is a great helper when creating queries, measuring and improving performance, comparing data and schemas, and much more! 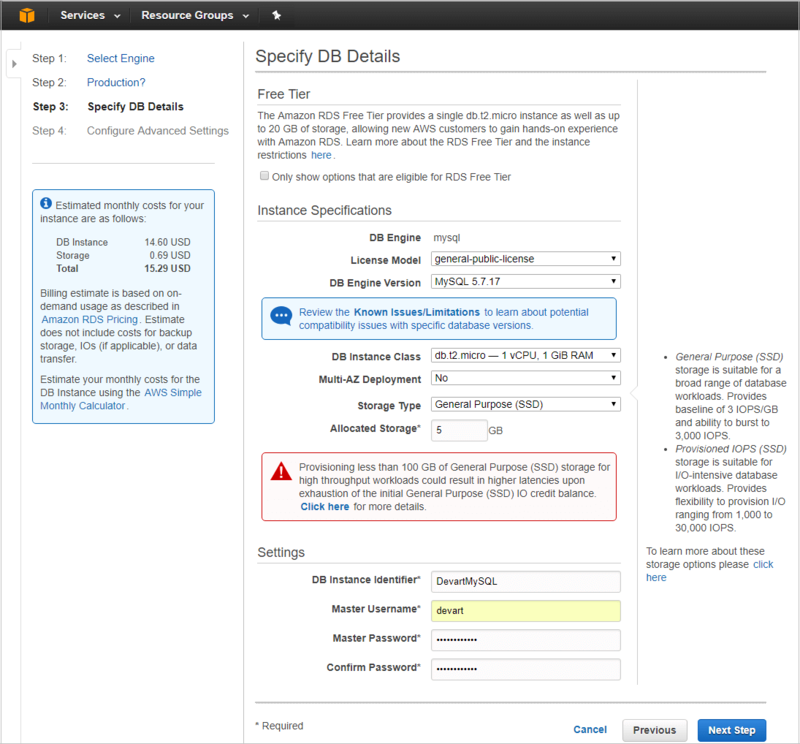 In addition to Amazon RDS support, dbForge Studio for MySQL also has broad compatibility and connectivity options, which you can find here.